The RB-PLI6 6 Way Mono Passive Line Isolation Unit. The RB-PLI6 passive line isolation unit is used to isolate audio signals from inter-area ground hum loops, which could be caused by equipment being powered by different mains power supplies or phases on the same supply. 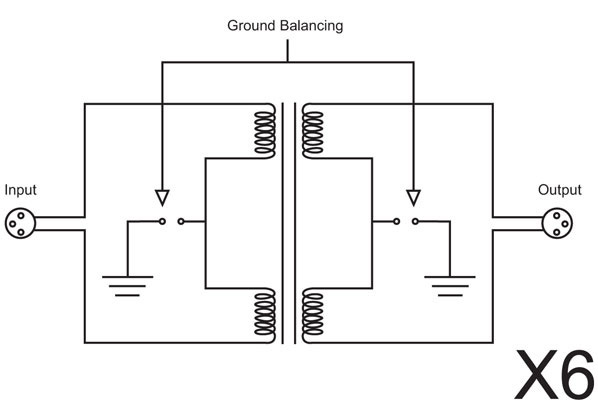 The input and output are connected together through a transformer, and the unit has internal jumpers allowing the inputs and/or outputs to be balanced about ground. The unit requires no mains power for operation. This unit is useful where audio is required to be driven over a relatively long length of cable. By isolating the signal using transformers, ground loop currents which can be present in non-isolated signals, are eradicated completely.